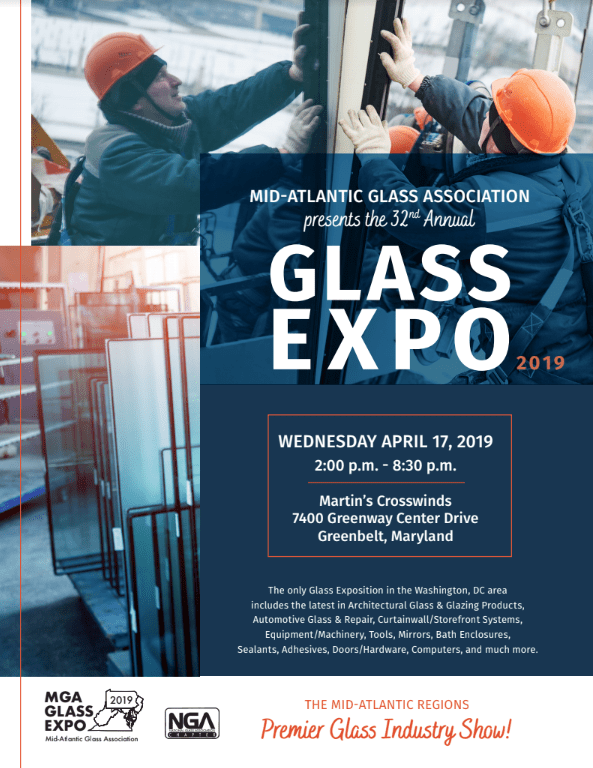 Mid-Atlantic Glass Association Expo 2019 | Wrisco Industries Inc.
Wrisco will be showing at the MID-ATLANTIC GLASS ASSOCIATION 32nd ANNUAL GLASS EXPO 2019, Wednesday April 17, 2019. The Expo will run between 2:00 pm and 8:30 pm at the Martin’s Crosswinds, 7400 Greenway Center Drive, Greenbelt, MD. Rich Young, Kevin Zimmerman and Rick Young will be there representing Wrisco Edison. MGA Glass Expo 2019 is the only Glass Exposition in the Washington, DC area. Includes the latest in Architectural Glass & Glazing Products, Automotive Glass & Repair, Curtain Wall/Storefront Systems. Equipment/Machinery, Tools, Mirrors, Bath Enclosures, Sealants, Adhesives, Doors/Hardware, Computers and More!